It is difficult for me to choose any one animal to be uniquely thankful for, mostly because I have had so many pets in my life that have meant the world to me. I am choosing not to pick a pet, but instead a symbol. I am thankful for owls. Owls were my Nana’s favorite animal. She absolutely adored them, had owl decorations and pictures and STUFF everywhere! And so when she passed away I found a love for owls because they reminded me of her. Now I have owl stuff and they make me feel whole, as though she is still with me. Some of the clothing and baby items I have purchased for my unborn child has owls on it. I get emotional thinking about this because it is so beautifully painful to talk about. My baby will know who my Nana was, and that means keeping owls nearby to protect my baby because whenever I was with my Nana I had never felt safer. The owls are guardians, they are angels, like my Nana. That is why I am thankful for owls. I must say that the person I am most thankful for is my husband, Akira. This man may not be a romantic, or into the same hobbies/books/music as I am, but he is truly an amazing person. He works hard to support our family, and our family means the world to him, which in turn makes me incredible thankful. I have never seen a man so devoted, and dedicated, to his wife, pets, and baby, which is still in the oven by the way. I knew the moment I met him that he was the right one for me, because he treated me like a lady and was sincere from the start. The way animals and children gravitate toward him, and how well he handles them, proved to me years and years ago that he was a family man that I would be proud to grow with. He may not clean the litter box as regularly as the cats require, and he may not be best at taking the trash out on time, but I forget my chores too. We have a very strong marriage built on humoring one another, sharing everything, and on love. There is so much love between us. We get each other, we understand each other, and know there have been losses both separate and apart, and we maintain our separate social lives and hobbies in order to stay strong when we’re together. And that is a beautiful time. He has shown me the value of family and of love, and I could not be more grateful. Becoming an author is no easy journey. It takes countless, endless hours of plotting, thinking, drafting, and sometimes sighing in frustration. But it is not impossible, and not always a tragic struggle. With a good support group, a few writing friends, or a trusty thesaurus, you too can be a novelist. 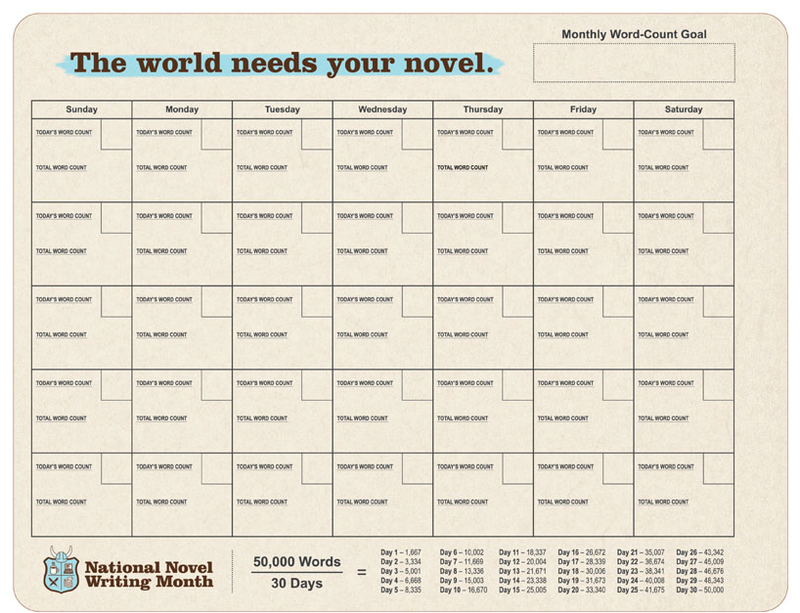 NaNoWriMo, National Novel Writing Month, makes it so much easier to become a writer. By setting a 50,000 word count goal, NaNo guides established, amateur, and enthusiastic writers through November to the goal of creating a book. As a NaNoWriMo Municipal Liaison for Maine, I am here to answer any questions, to guide you, and to provide you with any help you may need for your NaNo project. You may be thinking to yourself several questions. Allow me to answer them with my own experiences. I do not claim to be an expert on writing or on NaNo, but I have much experience with both. Can I actually write a book in a month? Yes, yes you can. Last year, with many word wars and hours spent drafting, I accomplished a word count of 50,060. How can I find the time? This may be the hardest part for most of us. Last year I was a substitute teacher during NaNo, and only worked per diem. This year I work a very rigorous full time schedule. It can help to spend 1 hour each day to just write. And, honestly, some times it won’t happen. It is up to you to set the time aside to write, and it is not always the most practical. Finding a writing group or buddy can help you find motivation and set special time aside. I meet Wednesday evenings with a group of writers in my area. We sometimes also meet on Sundays, and will be upping the meeting times as convenient. If you cannot get out to find a group, or individual, to brainstorm and write with then check the forums on NaNo. Send someone a private message, become someones NaNoWriMo buddy on the website! What if I can’t find a story, or lose inspiration? They are full of useful threads about writing, plotting, world building, drafting, editing, and other helpful pieces. And remember, those writers are reaching for the same 50,000 word goal that you are, and are always willing to help. Writers are welcome to post information on their novels to ask for help and inspiration, and the amount of help offered is certainly not lacking. What do I do if I finish my novel? Congratulations! You can gloat! Do it! Feel proud! You have accomplished a lot! Be sure to verify with NaNoWriMo’s website to tell them you completed your novel, and at the end of the month you will be allowed access to the winner’s page, which hosts several special offers for programs and purchases. Buy some NaNo swag at a discount! What happens if I don’t finish my novel? You have not failed. You are still a winner! No matter how many words you put down, you have taken the time to create something, and it is yours. Great work! Won’t living my life get in the way? Many people have families, kids, pets, other duties. I myself have a husband, a zoo of animals, and am nearly 5 months pregnant. Your time is valuable. If NaNo means something to you, you will find the time. Isn’t there a mandatory number of words I need to write each day? No. There is a guideline of 1,667 words per day, which evens the amount of work to a reasonable number daily. This is only mean to help you succeed in the 50,000 total word count. Below is the chart I made for myself last year. You can see in it that I had already started with a piece from last year so I made sure to keep track of my words minus the words written prior to November. You can also see that I did not follow the daily guideline. On the contrary. There were days I didn’t write at all, and many when I slacked off. However, I made it work, and you can too. If you have other questions, please, do not be afraid to ask. I would love to see more participants in NaNo all the time. And sign up today, before November 1st, for NaNoWriMo. Nano is now just DAYS away! Here is a calendar from the site I used last year. This was by far the best calendar I had found, that allowed me to keep track of my daily count, weekly count, and monthly count all in one sheet. Dave Seah is a calendar wiz! Check out his site here. An official that I really like! It allows you to follow daily progress as well as the overall 50k words. 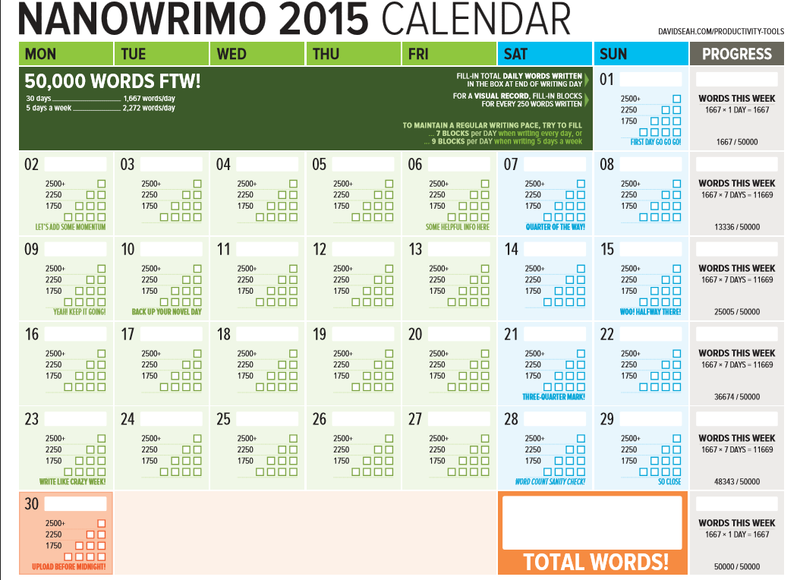 Sharing a great progress calendar for NaNo 2015. I enjoy watching my progress on a chart. This one comes from Writers Write’s Mia Botha. As fall starts, a chilly morning in Maine today, so too does preparation for NaNo 2015. This year I have been honored with a position as a NaNo Municipal Liason, a leader in the NaNo community for my region. Working closely with friends, we will be writing consistently and passionately for yet another season. 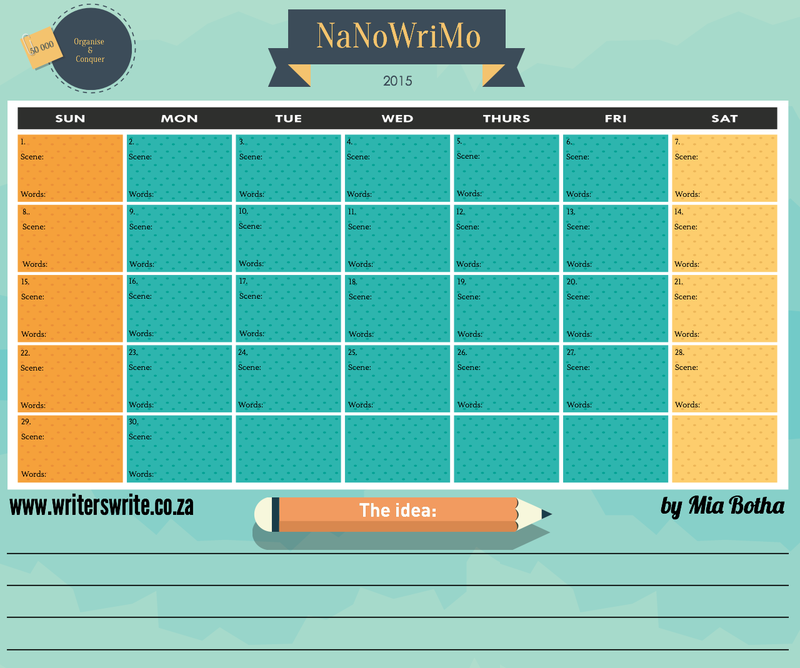 Please follow my progress at http://nanowrimo.org/participants/hobbitualliterature when NaNo starts November 1st. Between now and then I will be preparing for the month of rigorous typing and sleepless nights spent thinking about plot holes and conversations between characters. Spring is upon us and Camp NaNo starts today! Camp NaNo is much like the traditional NaNoWriMo, except writers are able to set their own goals. Also, writers are grouped into “cabins.” My group consists of some very talented ladies that I have the pleasure of writing with on a weekly basis. You can follow their progress and blogs by visiting my links page above. I apologize greatly for not having been the most active with my blog lately. Editing of manuscripts has kept me very busy, which I assure you is a wonderful thing! The more I edit, the more passionate I get about my works in progress! I cannot wait to complete more and share them with you! I am now printing my manuscript from my epic fantasy piece. It stands, without all the additional research pages, at over 59,600 words. In a size 12 font (and 1.5 space) in Word that is over 170 pages! Unfortunately, this is the easiest way for me to edit and get back into the piece after having taken a break to start a new paranormal romance story that has been whispering at me. Back into the realms I go! Please forgive my absence and look forward to great things! Also, please take time to check my blog’s Facebook page. I post wildly different things there than I do on my blog, as this page is dedicated to work of my own and the Facebook features writing tips and fun information. Make sure you rate, share, comment, and enjoy! The following poem is one I wrote on April 11, 2008, when I was 17 years old. Please enjoy, rate, comment, and share! Here are some helpful, and fun, color charts that I located. They have proven to be very inspirational when describing shades while writing. Please rate, comment, and share! Search for answers to thoughts unknown. Crafty musings have been un-sown. How to proceed, start dissolution. What do we do? Can we renew? Tonight, listening to Sara Bareilles’ song “Brave,” I found myself inspired to write a free verse poem illustrating my passion and determination. Everyone has a story to tell, demons they have battled, and I would like to share some hope. Here is a poem I wrote in college, my freshman year in creative writing, on September 23, 2009. Please enjoy, rate, share, and comment. Written on October 2, 2009, this 1 minute play was an assignment in a college creative writing course. Please enjoy, rate, and comment! If a philosopher speaks and nobody listens, does he exist? A weary philosopher confides in his grown grandchildren as he lies in his deathbed with one final piece of information. Hobbitual Literature has a new look once again! I was so excited about how the last theme felt that I overlooked functionality. It was neat, formatted to feel like you were reading the blog in an e-book format, but it just wasn’t doing what I needed it to do! Thus, Hobbitual Literature got a makeover! I met the man who became my husband about 5 years ago, in January 2010. I came across a small scrap of paper with the date on the upper corner. In December 2010 I was apparently feeling quite poetic and wrote him something sweet. Written in green ink, the following words were meant for that wonderful man. Pen to the paper and what do I hear? A scribbled scratch of poetry being born. I would like to wish you all a very happy new year. May 2015 bring you new literary goals and happiness.